Metadata are details of any file which are included in the file and this includes data like author, date created, modified, type of file, computer used for creation and many more details. When you share any file with your friends, its better to remove these personal information from the files. 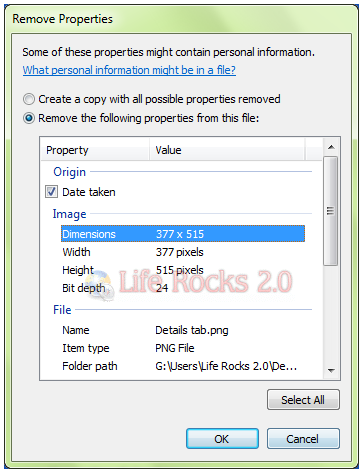 If you are sharing photos, you can check this freeware to remove metadata from images. 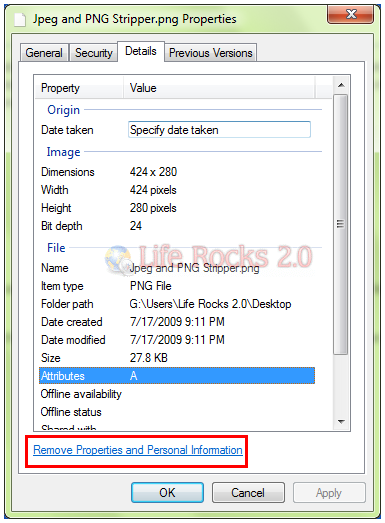 In Windows 7 (also in Vista), you can easily remove the metadata from any file using the properties window. In order to remove personal information and properties, follow the steps below. 1. Right-click the file, and then click Properties. In the Properties dialog box, click the Details tab. 2. At the bottom of this tab, click on “Remove Properties and Personal Information.” link. This will open up Remove Properties dialog box. 3. Here you can either Create a copy with all possible properties removed, and then click Ok or keep the original version of the file with all of its properties, and makes a copy with all of the properties removed that’s suitable for sharing. Click Remove the following properties from this file, select the check box for each property that you want to remove, and then click OK. This permanently removes the selected properties from the file without making a copy. Now you can share the file without having to share any personal information or properties of the file. Nice share. Its great that you are reviewing apps for windows 7 too. The title is rather misleading. You can’t remove metadata from any file in Windows 7. For example, you can’t remove metadata from AVI’s and WAV’s. For that you’ll need a third party tool like BatchPurifier. Windows 7 won’t even show you the metadata that those files contains, even though it has a ‘Details’ tab. Moreover, even for the files that you can remove metadata with Windows 7, you can’t remove them all. For example, you can remove only few fields of Exif metadata from photos. Most importantly, it won’t remove the infamous Exif thumbnail. Hi! There’s also a little online tool that helps to remove personal data from JPG files. It’s here: http://www.exif-remove.de . Is there a way to do this on multiple files? Maybe like on a whole directory? If that was all it took I would have alrady done it, FFS. Also, this doesn’t even bring up the ADS stream files used in NTFS systems. You can also hide data inside the file if you really wanted but the ADS info can contain all the information that EXIF has and even more. This is bad advice here.